I had an assumption of what my pie chart would show. I knew there would be a strong Eastern European representation, as we’ve previously traced my Grandpa’s lineage to Poland. In fact, the signatures of his grandparents are recorded in the pages of the Ellis Island intake logs. I also heard my grandmother’s father was 100% Norwegian, so I believed Scandinavia would appear as well. My maiden name has Irish roots. What I was curious about, was the potential for what lied within the unknown. 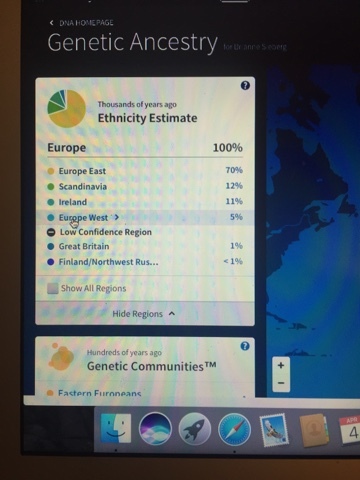 As I mentioned in this post, I received an Ancestry DNA kit last Christmas and didn’t waste much time sending it in for testing. Humanity’s quest to answer the existential question of WHO AM I, was as simple as spitting into a small tube. My results were emailed to me on April 4, and even with my long held assumptions, I still managed to be surprised. 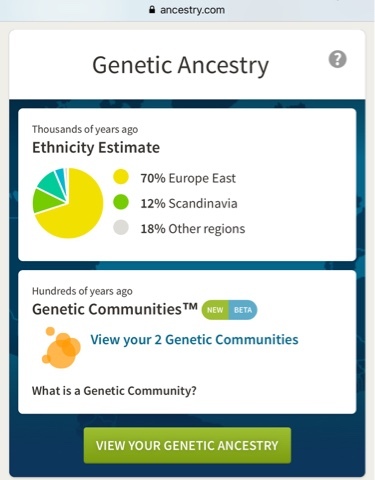 My DNA profile is of 100% European ethnicity, further confirmation that I am a descendent of immigrants. I swelled with pride by this, wondering if I was pursuing and achieving the kind of dreams my ancestors hoped for when they settled in America. Seventy-percent of my profile is Eastern European. I was caught off guard by how large this representation was. When I clicked on the more detailed description of this result, Poland lit up like a Christmas tree. Most notably, the region where my Grandpa’s grandparents once lived. Seeing that connection confirmed, I couldn’t deny the tears that began to collect in the corners of my eye. My pie chart showed I was 12% Scandinavian, and 11% Irish. Then I learned of the minor representations in my profile – 5% traced to Western Europe (the areas surrounding Belgium, France, Germany, the Netherlands, Switzerland, Luxembourg and Liechtenstein), 1% to Great Britain and less than 1% to Finland/Northwest Russia. These were unexpected. I kept coming back to my Polish ancestry though. I’ve often expressed my intent to return to New York City and tour Ellis Island; to see their signatures in the logs and to tour where they may have once stood. And now more than ever, my goal of traveling through Poland at least once during my lifetime has been renewed with fresh vigor. It is no longer enough to see the results of a DNA test, though it is something I’m happy to know. Now I must experience it, and see for myself. This has truly been one of the best gifts I’ve ever received.